We love giving you fun front door wreaths ideas to make with simple supplies. 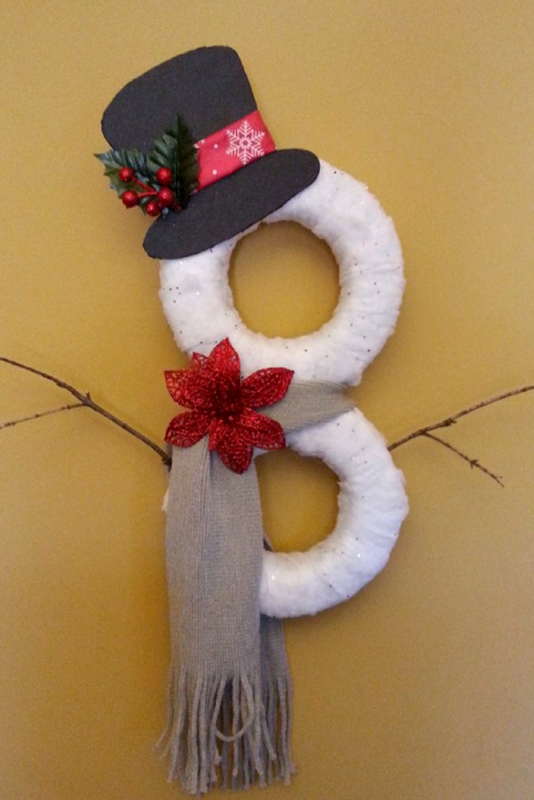 Our friend Allison made this great Snowman Front Door Wreaths Idea last year and shared with us. It is simple, inexpensive, but also a great addition that is ideal for winter. You can put this up in November, and leave until February if you want! Since it isn’t a holiday specific wreath, it is a perfect choice! This post contains affiliate links. If you make a purchase through our links, we earn a small commission. While we tend to stick with Dollar Tree supplies for things like this, you can also shop online or at your local craft store. Most of these supplies are super easy to find year round, with a few items specific to the winter or holiday time of year. Glittered Drape (32 in x 40 in) – Usually found near tree skirts, etc. Cut your glittered drape into long pieces. You should have enough pieces to wrap both floral foams twice. Begin wrapping your foams once. Because of the static of the foam and the cotton of the drape, there is no need to secure it, as it will stick to the foam and itself. Once you have both foams wrapped once. 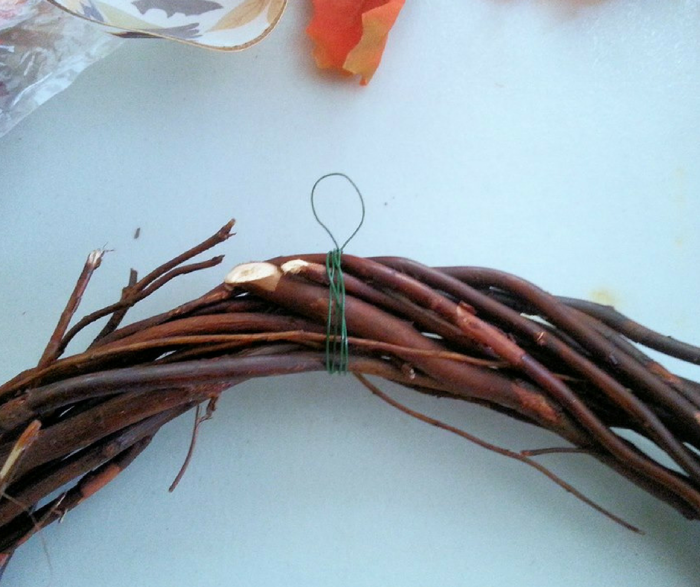 Take your floral wire or craft wire and begin wrapping the 2 foams together. Then cut off the end and push down into the foam. Add hot glue to secure it. The start wrapping your second layer of the drape. Once you’re done that add drape around the wire to cover it. Cut off some floral or craft wire and begin twisting it. Once you have it all twisted make a loop to hang. Push the wire ends into the drape and foam. Add hot glue to secure. Print out or draw your top hat on your foam board. Cut out. Then take your black Sharpie and color in the outside of the hat to cover up the white foam. Add your ribbon to the hat and decorate with your accents. Hot glue it to your snowman. Take your scarf and tie it to the wreath. Add another accent if you’d like. Add your twigs. Make sure you know where you’re going to place them before you push them into the foam. Once you have that figured out. Add some hot glue to the end of the twigs and lightly push them into the foam. 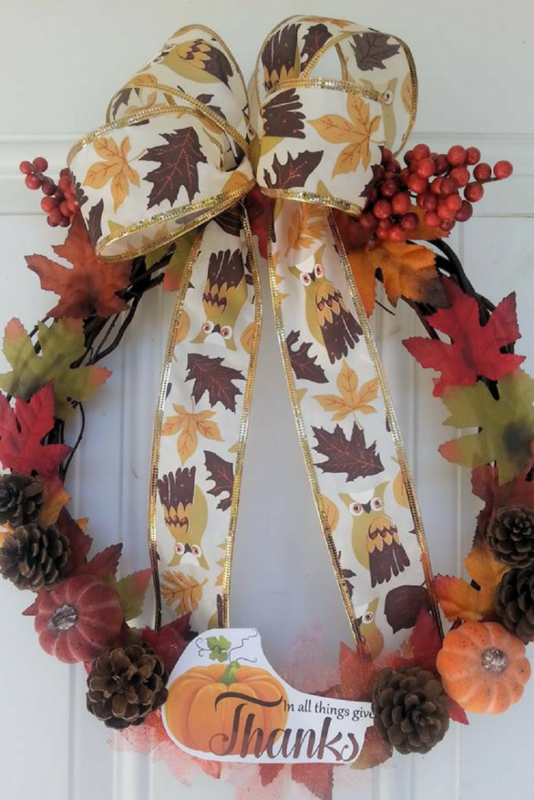 This easy front door wreaths idea is as low as $5 in out of pocket cost. If you already have a few holiday-themed ribbons or decorations on hand, it could be even less. Of course, I don’t count things like a glue gun, hot glue, sharpie, etc. in the cost since those are already in most craft rooms. 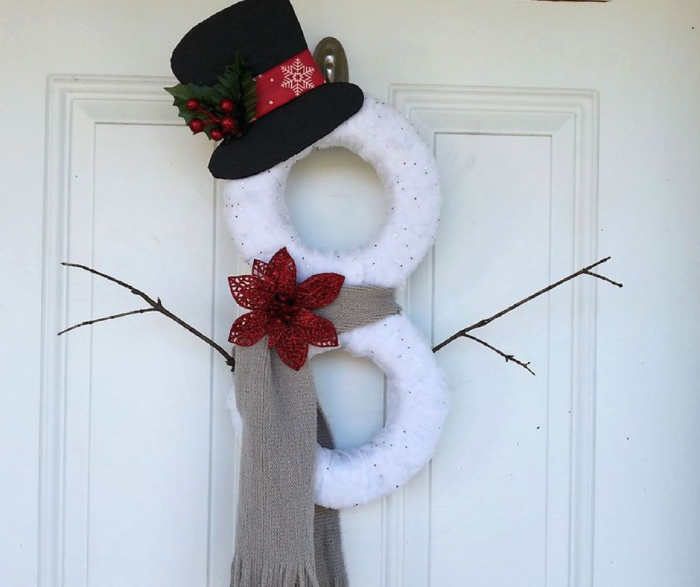 Create your own fun and unique Snowman front door wreath to use this winter! 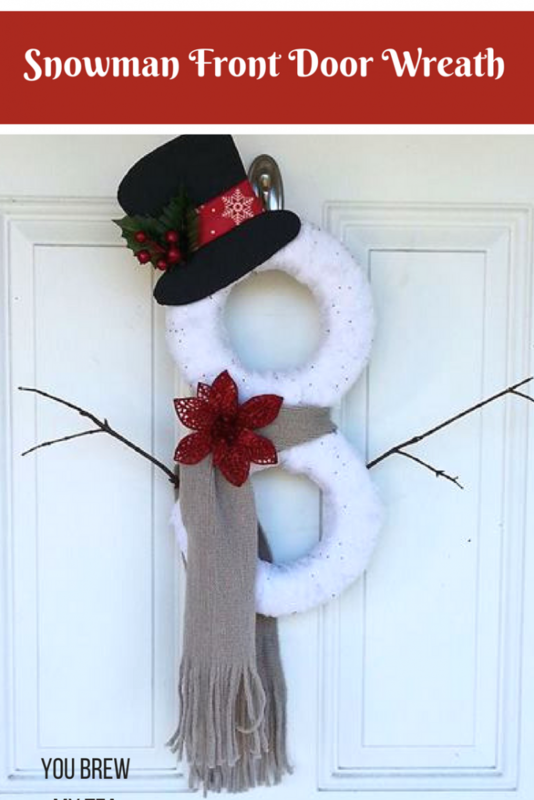 Customize with your own favorite snowman accessories, and have fun making it a custom wreath you’ll love! 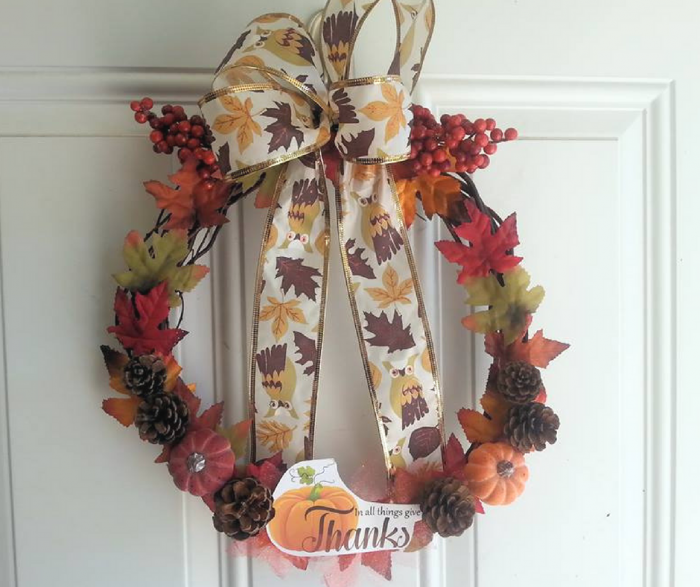 This Dollar Tree Autumn Wreath Tutorial was made by my friend Allison and shared with us. It is so easy, inexpensive, and a great cute craft idea to do with your kids. I love how creative she is, and I am sure you’ll love this tutorial as well! Make this now to last throughout the fall holiday season! This post contains affiliate links. I will earn a small commission from purchases made via these links. 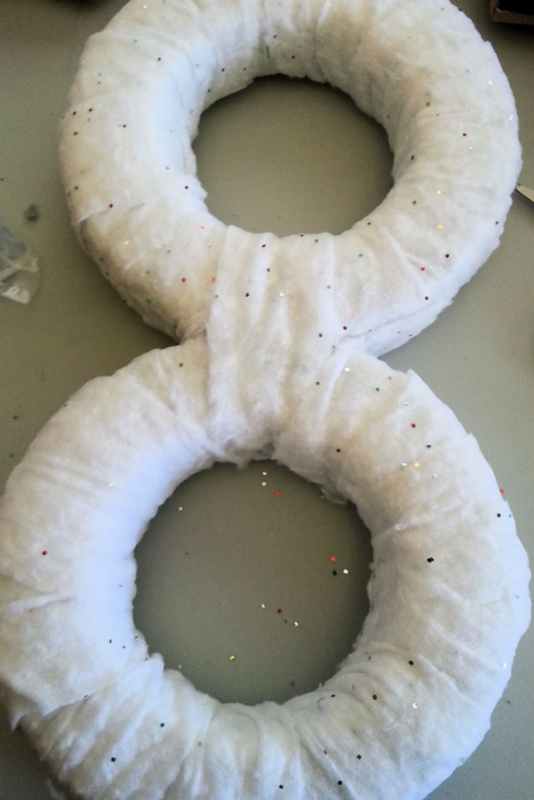 We love using the Dollar Tree to make easy crafts. I often stop in for an item or two and end up coming home with small items to add to our craft box. I’ve also fallen in love with the fact that I can now order items from Dollar Tree online. Sometimes I want to make a large batch of something for school crafts, or even gift items. Ordering online makes it easy for me to grab enough in one spot. 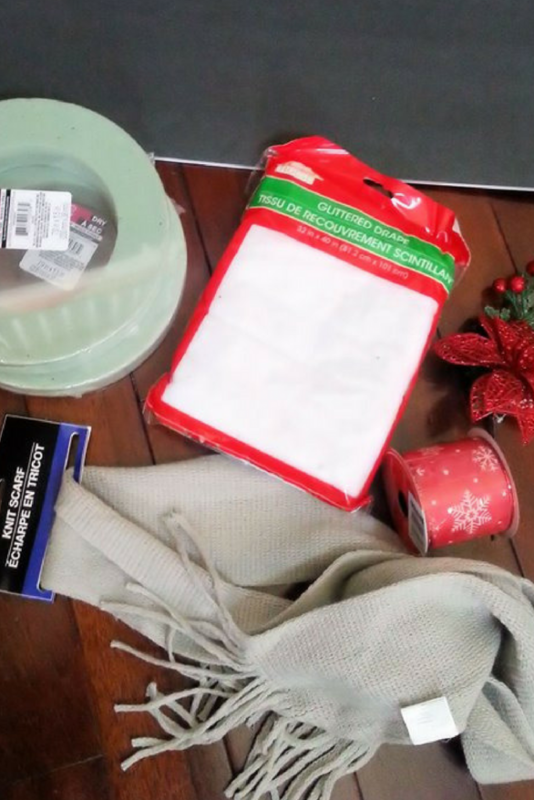 I am including links below to the supplies on Amazon, but as mentioned, you can find all of these at your local Dollar Tree in their holiday craft section. Go around your wreath form and make sure you don’t have branches hanging out if you are using a Willow wreath or grapevine. 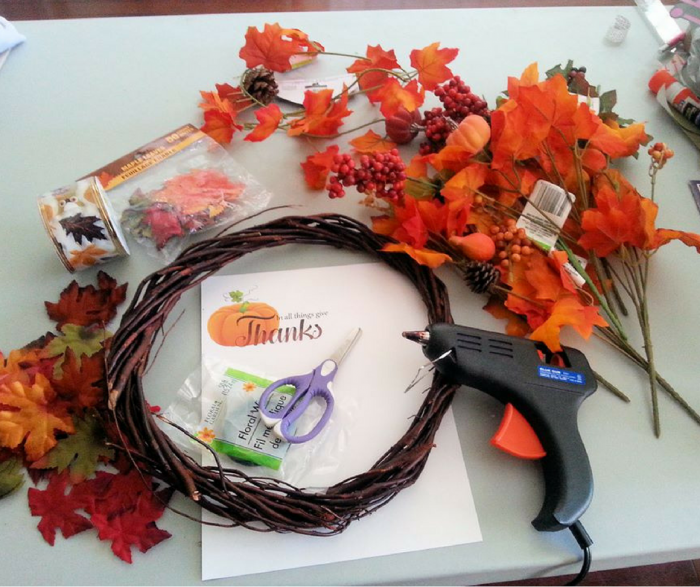 Print a Thanksgiving or Autumn creating to use on your wreath. I used card stock that I had to print out a simple image I found online. If you don’t have card stock you can use regular paper and cut a small piece of a cereal box to give it support. Make your bow. You can use a twist tie to get the right shape you are looking for. Once you have the right shape you can untwist the twist tie and add floral wire or just use the twist tie. Cut off some floral and make a hook if you don’t have a wreath hanger. Once you have your hook done. Add your bow. Start adding your leaves around your wreath. Once you have all those added it’s time to add the berries. You can put them anywhere you’d like. I put mine up by the bow. Now it’s time to cut out your thanksgiving print out and add it to the wreath. After you’ve added that then place your pinecones and pumpkins to the wreath. As you can see, this autumn wreath is a super easy and affordable option to add to your front door this year. 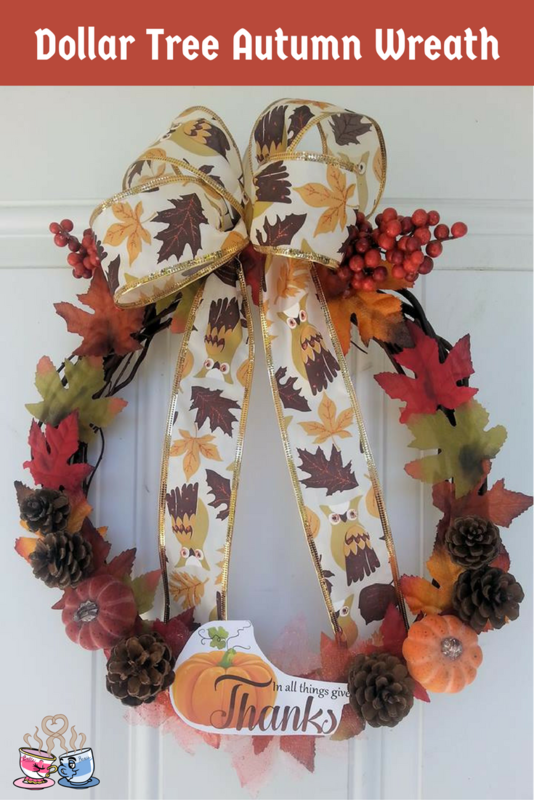 It brings all of your favorite fall colors and themes into one simple to create wreath you will love adding to your home! We just love creating simple crafts like this one that fit into your budget as well as fit your holiday decor needs. The holiday season is upon us, which means lots of family and friends over for holiday meals. Every little detail has to be managed, and our friend Katie from The Homespun Hydrangea has some great Creative Napkin Ring Ideas that you are going to love! You might think it takes a lot of time and cash to create a gorgeous holiday tablescape, but the truth is you can do this on a dime. If you want to fancy up your holiday table and make your guests feel special, take a look these ideas! This post contains affiliate links for Amazon. I may earn a small commission from purchases made via these links. There is something quite warm and cozy about twine. 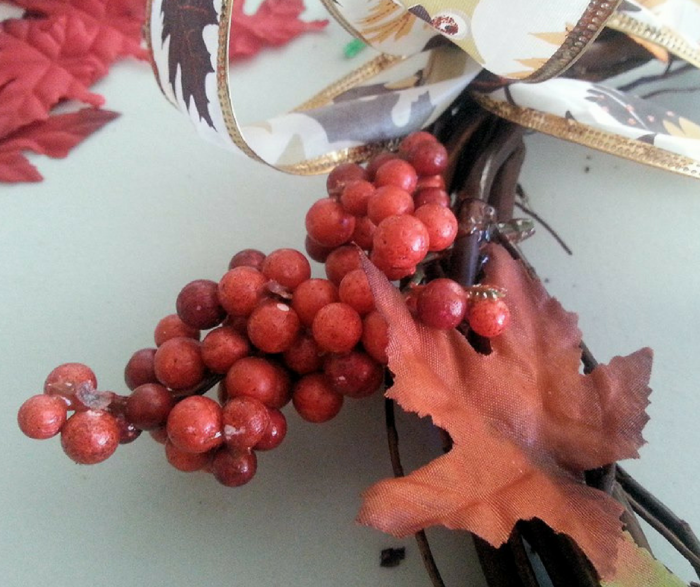 Add it to your fall table by wrapping it around napkins and tying it into a bow. You can use basic brown twine found at the dollar store, or use colored twine like orange or dark green. I love this colored twine set that offers up tons of variety. It’s perfect for this, but also for keeping in your craft room for future projects. Grab a bag of silk leaves from the dollar store. 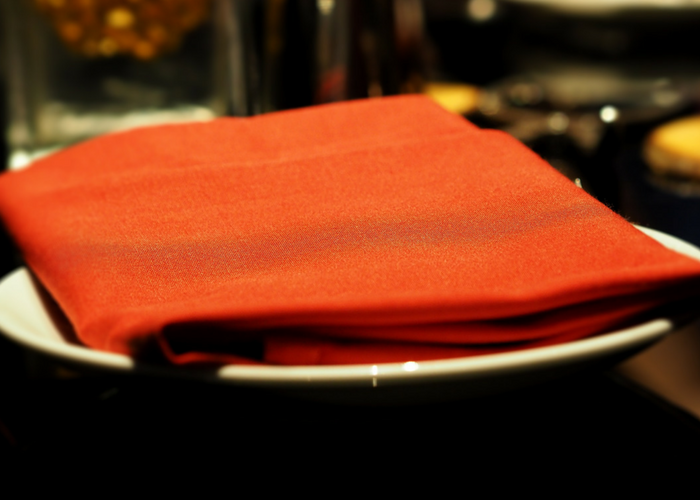 Wrap a leaf around your rolled napkin and secure it with ribbon. This is a fun way to color, plus the leaves can be scattered on the table when the napkins are opened. This is a great way to add additional décor to the table. This multi-pack of fall leaves on Amazon is a great deal for tons of leaves. Take your cardboard rolls from toilet paper or paper towels and cover them with fall-themed craft paper. Cut the rolls into one-inch segments and slide the napkins right through. There is no limit to the patterns of paper you can use! Start saving those cardboard rolls so you have them on hand when you are ready to craft. You can also check out our own Upcycled Fall Flannel Napkin Ring idea using this method and fabric scraps! Pipe cleaners are so inexpensive! Braid colorful pipe cleaners and wrap them around your napkins. You can use fall colors like orange, red, and yellow. 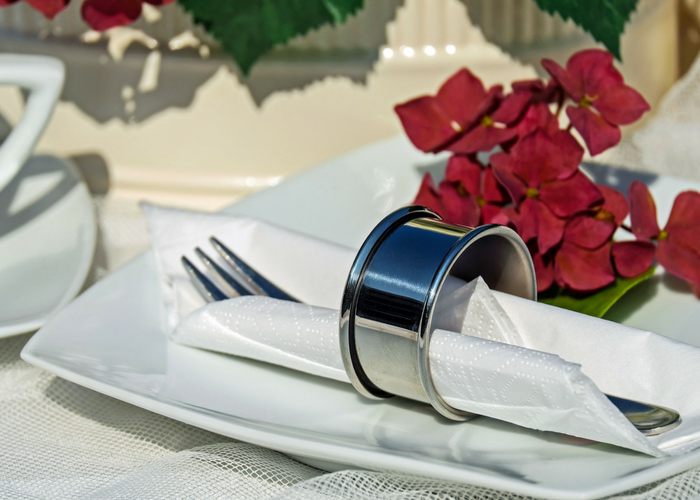 This is a napkin ring idea that even kids can do, and you can use any colors to match your tablescape. 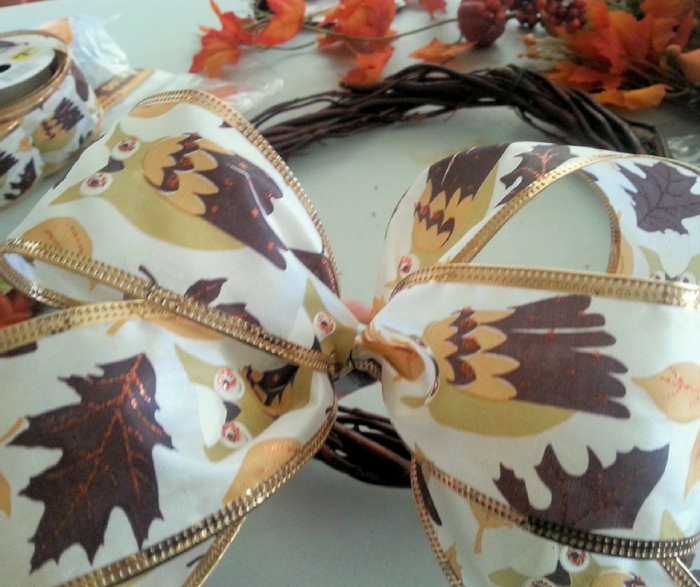 Use any fall colored ribbon you have on hand and wrap it around your napkins. Tie it into a fancy bow and you can even glue a small leaf to it if you wish. 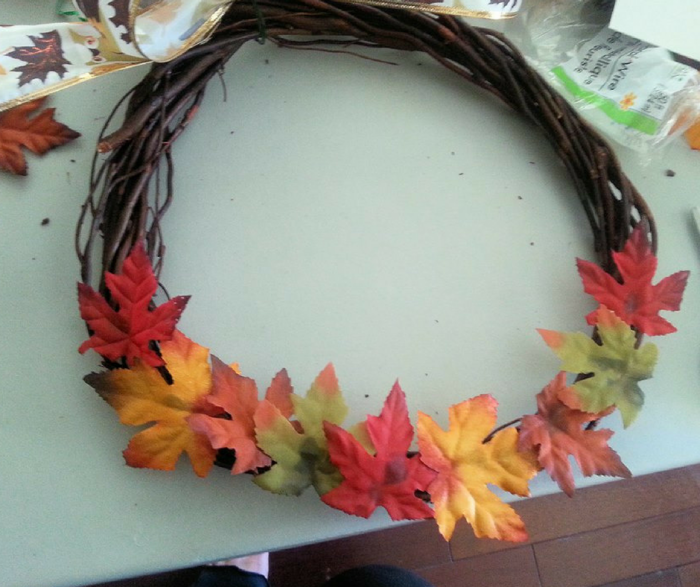 Dollar stores have all sorts of fall leaves as well as fall ribbon, so this is a craft you can do for just a few bucks. 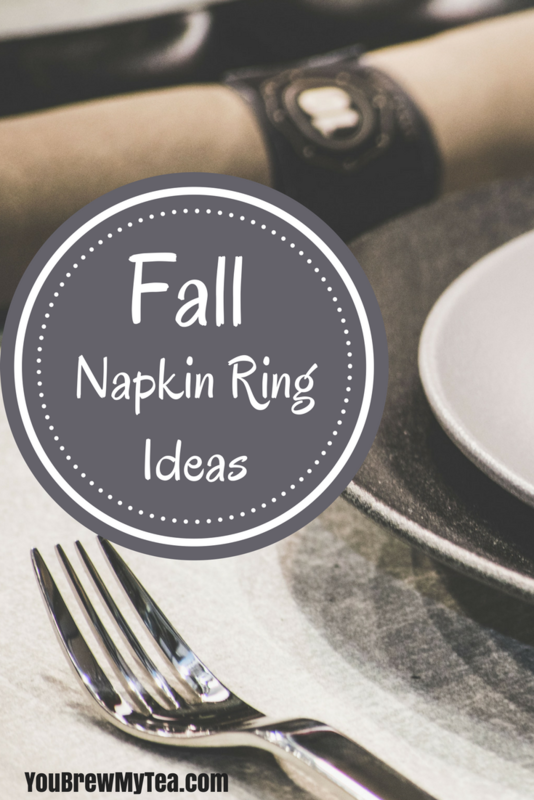 This is, by far, one of the easiest fall napkin ring ideas ever! Head to the dollar store for gold finish ornaments. These are typically plastic with ribbon or string and can slide right on your napkins. An additional bonus is the ornament can be taken home by each guest so it also makes for a small gift. Do you have tons of scrap fabric on hand? Cut or tear the fabric into inch wide strips and use it to wrap around the napkins. 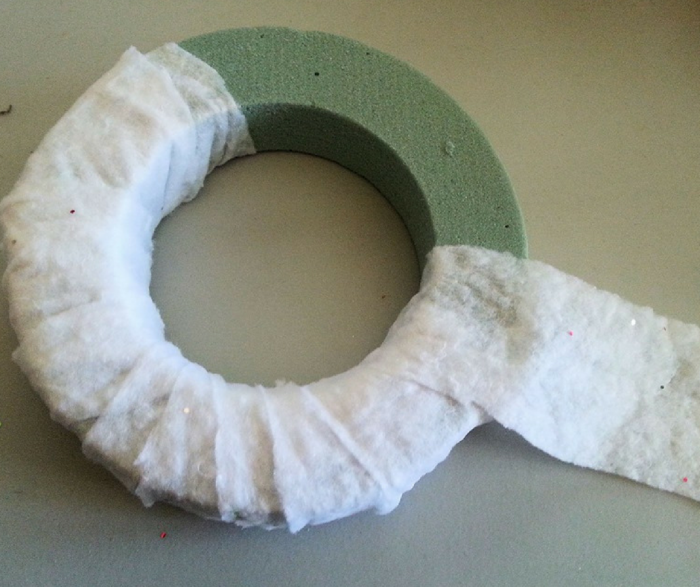 You can simply wrap and tie in a bow, or you can use the fabric around a cardboard tube as mentioned above. This is a great way to use leftover fabric strips while adding color to your holiday table. Use craft scissors to cut fabric with unique edging without having to sew! Fun, festive, and fast! Give these creative fall napkin ring ideas a try and see how simple it can be to add some fall fun to your holiday table. Make sure to head over to Katie’s blog and check out our other top great ideas like this Upcycled Wood Pallet Pumpkin Craft! I have been compensated by Johnson’s® Baby for this post; however, I am sharing my own thoughts. All opinions are my own. Have you ever wanted to gift something fun but been at a loss for how to make it unique? 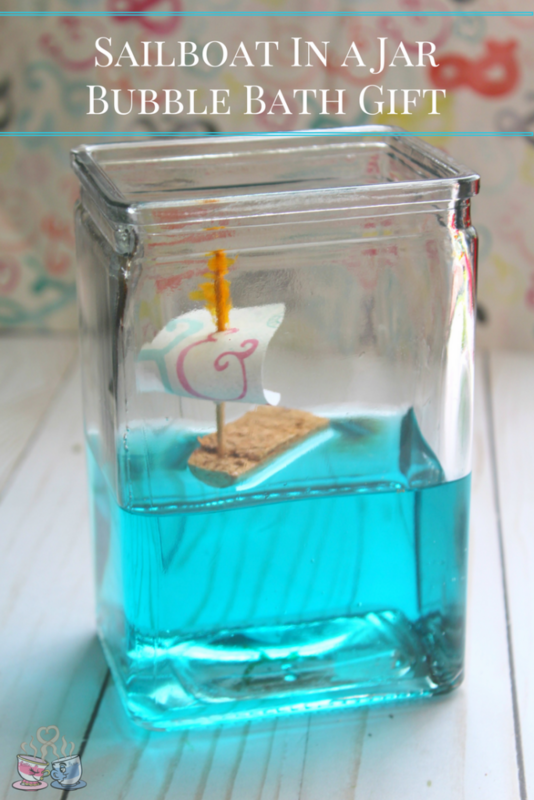 Wine cork crafts are a favorite of mine, but this Sailboat in a Jar Bubble Bath Gift is a perfect choice for making fast and easy with our secret hidden ingredient thanks to our sponsor, Johnson’s® Baby products. I do a lot of shopping at Walmart since it is convenient and affordable. Picking out birthday or anniversary gifts is easy when you shop there, and of course, I often find the best ideas come and are inspired by the most unlikely products. A friend of mine has a birthday coming up, and she absolutely loves visiting Lake Michigan. Her family often rents a sailboat for a day out on the lake in the summer. I knew, she also is someone who would fuss at me for spending much on a gift, so this was a great idea! I started by picking up a few supplies. Most of these are available at a local craft store, but the Johnson’s® Baby Bubble Bath is an item I grab at Walmart. It’s available in the baby section, but also with other bath care products near the soaps. I tend to visit the soap section, but if you have a baby, you’ll be in the baby department. Begin by using the serrated knife to cut the wine cork in half, lengthwise. Cut slowly and take your time to avoid injury. Cut out your sailboat sail from the scrap paper. A simple oval shape works perfectly. Create the sail by poking the toothpick through the oval, and place the sail into the half of the wine cork. Your boat is now complete. If you want, you can personalize with a boat name on the sail, or even the receivers initials. Fill your vase or jar halfway withJohnson’s® Baby Bubble Bath. 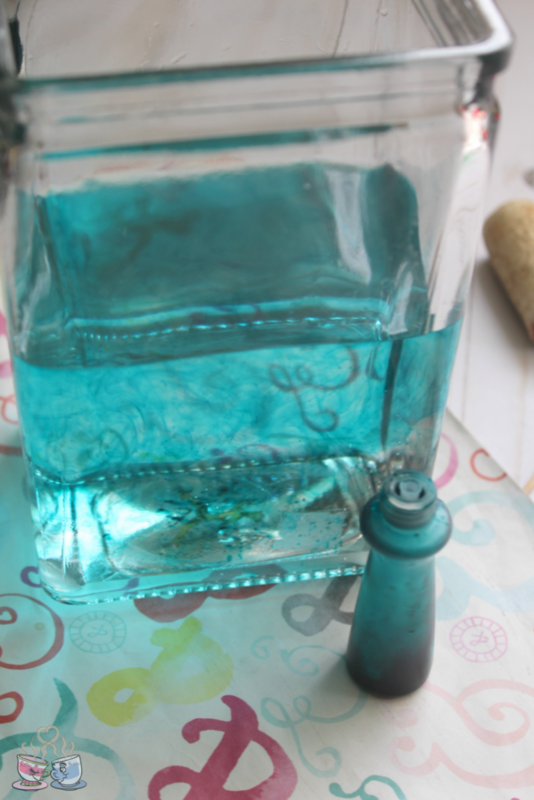 Add a few drops of blue food coloring and stir gently to mix. Place the wine cork sailboat onto the top of the bubble bath. For gifting, add a lid and wrap with ribbon and a message on a card. This bubble bath gift idea is a great option for a gift that anyone would love. 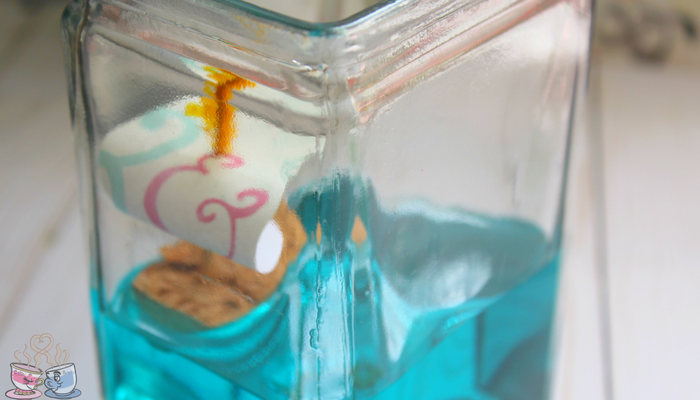 Not only is it a cute idea to display in a bathroom on a counter or shelf, but it is totally functional! They can just remove the lid, and pour a bit of the Johnson’s® Baby Bubble Bath into their bath to create a wonderful evening bubble bath. For more great Johnson’s® Baby Product ideas, check out the Johnson’s® Baby Hacks Pinterest Board! Think outside the box to make unique and fun gifts using classic Johnson’s® Baby Products you already have on hand or can find at Walmart in the soap aisle or baby department. 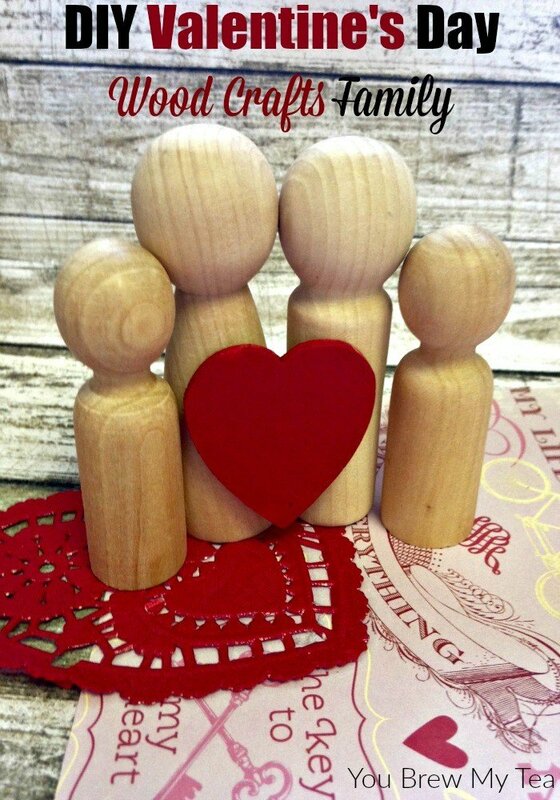 This super cute Wood Crafts Family is ideal for a cute DIY Valentine’s Day craft to set up and play with this year! My friend Katie from The Homespun Hydrangea made this for us and as always, she came up with just the cutest simple and inexpensive craft to share. Check out her instructions and tips below! Wood Crafts are always fun to make. 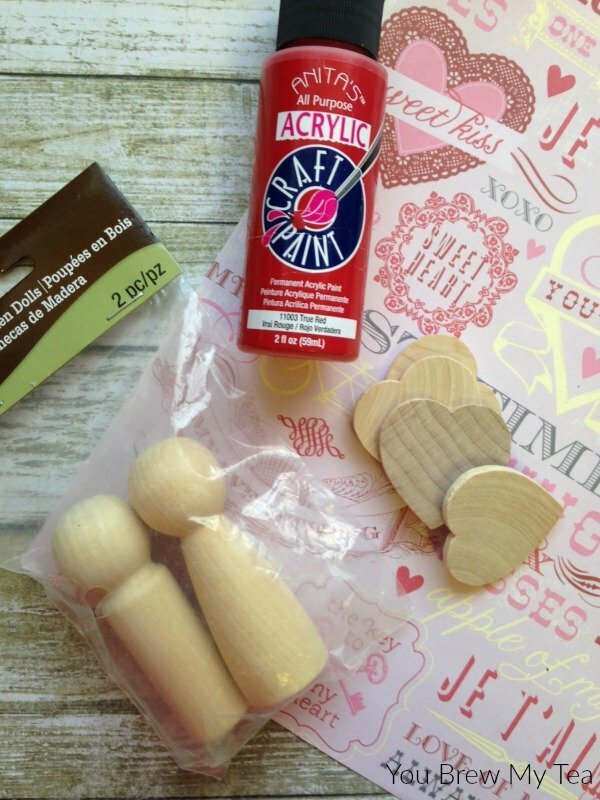 I love using simple dollar store pieces like these little wooden figurines, some paint, and scrapbook paper and accessories to create a simple little centerpiece or addition to go onto the mantle during the Valentine’s Day season. It’s just perfect for creating a beautiful theme to remind me every time I walk by my fireplace of how much I love my family. I prefer to head over to my local Dollar Tree to grab supplies. Let’s face it, I am cheap as they come when it comes to holiday decor. Especially for DIY Valentine’s Day items. These won’t last for several years, so I’m not worried about a huge investment. If you prefer, you can grab the supplies online through Amazon (links below), or at a hobby store like Hobby Lobby or Michael’s. 1. Begin by lining up your wood dolls in the order you wish for them to be. You can do the two adults in the middle and have the children on the sides, or place the adults on the end and put the children in the center. 2. 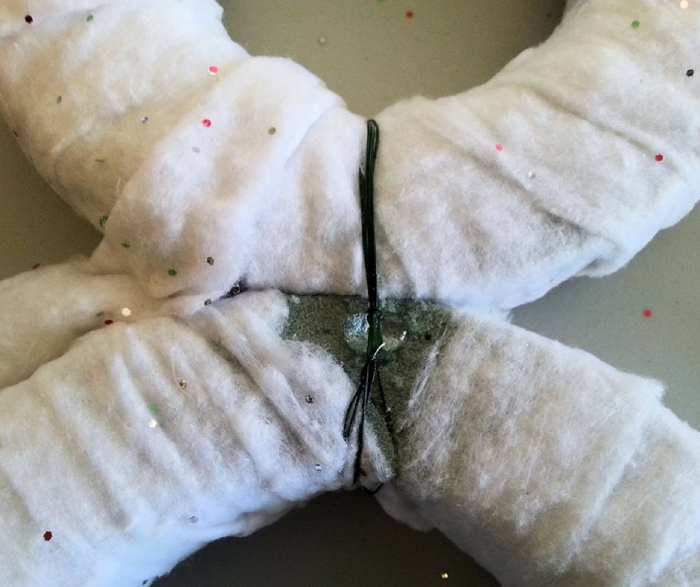 Add some hot glue or super adhesive in between each doll and press together. Press firmly so they adhere to each other well. 3. While those dry, paint your wood heart. You can use any color you wish, or opt for the obvious red or pink like we used. Allow it to dry. 4. Once the heart is dry, add some glue and press it to the center of your family. Hold it in place until secure. 5. Optional: Using a permanent marker you can write the family name onto the center of the heart. As you can see, this simple DIY Valentine’s Day Wood Crafts Family is a super easy and cute idea for decorating your mantle or just for letting your kids create a fun way to show love for their family. I adore the idea of using this as a way to help kids learn more about a family during the season of love! 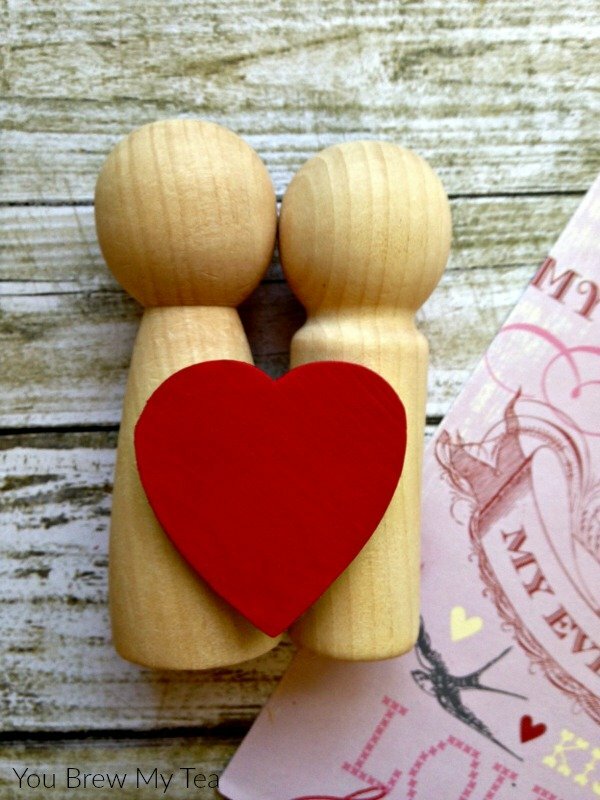 Gather up supplies, and make a fun wood crafts idea like this one to help share love and family during the season of love. This is an ideal craft to help teach your children about how family includes more than just those within your home, but who lives within your heart.